CHATTANOOGA, Tenn. -- FBI officials say some of the Marines killed last week in Chattanooga, Tenn. sacrificed their lives to save others. Mohammod Abdulazeez is accused of killing four marines and a naval officer in a shooting spree at an armed forces recruiting center and a Naval support building. Authorities recovered three weapons belonging to Abdulazeez. There were also two other guns at the shooting scene. "Those weapons belonged to service members and at least one of the weapons was discharged at the subject. Whether he was struck by those individuals is unclear at this time," said FBI special agent Ed Reinhold. 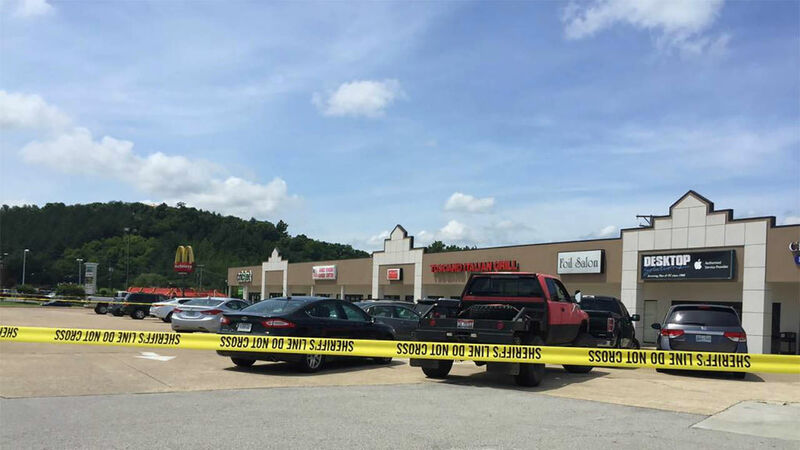 A Chattanooga police officer shot and killed Abdulazeez. Investigators say Abdulazeez acted alone. At least four Marines were killed and a soldier and a police officer were wounded in shootings at two military facilities Thursday in Tennessee. The shooter also was killed. Three to five minutes was all it took 24-year-old Abdulazeez to punch through a gate with his rented Ford Mustang and blast his way into a Navy-Marine reserve center, killing four Marines and mortally wounding a sailor. Officials on Wednesday released new details of last week's brazen assault in Chattanooga, describing a chaotic scene of mostly unarmed Marines scrambling to escape the man who approached with an assault rifle, a handgun and a vest full of extra ammunition. Five didn't make it. One service member inside the building saw Abdulazeez approaching and fired at him, likely with a personal weapon. Abdulazeez shot back, entered the building and fatally wounded Petty Officer 2nd Class Randall Smith. At the same time, Marines ran from room-to-room, trying to get their fellow service members to safety. 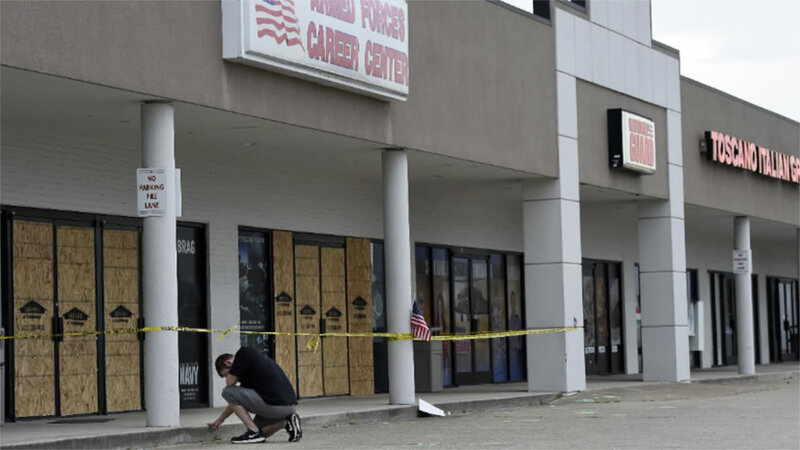 Meanwhile, Chattanooga police were just behind Abdulazeez, having been called a few minutes earlier when he opened fire on a military recruiting center about 7 miles away before driving off, leaving the windows pockmarked with bullet holes. As Abdulazeez made his way through the reserve center he "continued to shoot those he encountered," FBI Knoxville Special Agent in Charge Ed Reinhold said at a news conference. Then he walked out the back door into a gated motor pool area where troops were scrambling over a fence to safety. At least two Marines tried to "provide cover" for the others, Reinhold said. Abdulazeez shot and killed four Marines: Staff Sgt. David Wyatt, Sgt. Carson Holmquist, Gunnery Sgt. Thomas Sullivan and Lance Cpt. Squire "Skip" Wells, a Marine who just moments before had texted his girlfriend in Savannah the words "ACTIVE SHOOTER." The whole thing ended just a few minutes after it began, as police caught up to Abdulazeez, shooting and killing him - but not before he managed to wound one of them. A total of 20 Marines and two Navy corpsmen were at the center that day, checking their equipment after a training mission in California. Military personnel are generally prohibited from carrying firearms at military recruitment centers and bases, but Reinhold said two guns belonging to service members were recovered at the scene. Shots were fired from at least one, but it's not yet clear if the gunman was hit by fire from one of those weapons, Reinhold said. The military will investigate whether the service members were authorized to have the guns. Reinhold declined to elaborate further on how the troops engaged Abdulazeez. Maj. Gen. Paul W. Brier, commanding general of the 4th Marine Division, said, "I can tell you that our Marines reacted the way you would expect." It is too early to determine whether Abdulazeez was "radicalized" before the attacks, Reinhold said. But when asked if Abdulazeez acted alone, Reinhold said he was currently being treated as a "homegrown violent extremist." Abdulazeez spent several months with an uncle in Jordan last year as part of an agreement to get him away from drugs, alcohol and a group of friends his parents considered a bad influence, a person close to the family has said. That person spoke on the condition of anonymity to avoid business repercussions. The uncle has been detained in Jordan but has not been charged with anything, according to the uncle's attorney. Friends and neighbors recalled Abdulazeez as a happy, polite young man. But a picture has also emerged showing a darker side, with Abdulazeez's family saying he struggled with depression from his early teens, abused drugs, couldn't keep a job and was considering bankruptcy. He graduated from the University of Tennessee, Chattanooga, in 2012 with a degree in electrical engineering, but a job at an Ohio power plant in 2013 lasted only a few days before he was fired over a failed drug test. Shortly after that, he lamented in personal writings that he was a failure and his life was worthless, the source close to the family has said. Recently, Abdulazeez had found a job about two hours away in Franklin. He was working the night shift at a manufacturing plant, but he was taking medication - to help him sleep in the daytime and a muscle relaxant for a back problem, the person close to the family said. His family last saw him the Tuesday before the shootings, thinking he was returning to work. The shooting occurred on Thursday morning and investigators are still piecing together what Abdulazeez was doing and who he was with over that two-day period. But so far, they do not think he had any help with the attack. "We believe he acted on his own that day," Reinhold said. "We do not have any indication that anyone else was assisting him on that day."